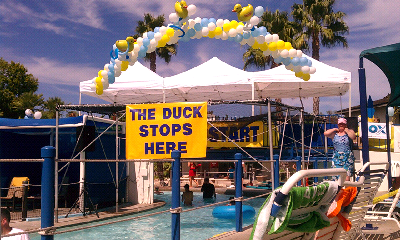 Yesterday we were in Irvine for the 18th Annual Mighty Ducky Derby. This fundraiser helps the Children's Bureau of Orange County. There was free food sponsored by great restaurants. Restaurants like In N Out, Buca di Beppo, Royal Thai of Newport Beach, Lawry's, Souplantation, Nothing Bundt Cakes, Flame Broiler and so much more!! 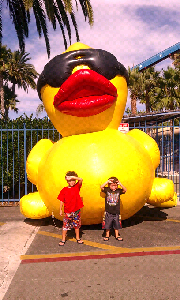 It was a hot day in Irvine and the kids had so much fun. Of course....its a waterpark!